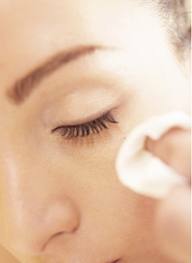 Put a little toner on a piece of beauty cotton and rubbed gently into the face will abolish and absorb oil and dirt on face and tightens pores. The skin is basically acidic, with pH between 5 and 6. After the face washed with soap and water, skin pH balance disrupted by the alkaline nature of soap, skin pH will rise. When that happens, the skin must work hard to restore that balance. But, the use of facial toner will help restore this balance quickly and make the skin pH back to normal. Toner can shrink pores and tighten the back bonding of skin cells after washing our face, and reduce the penetration of dirt and various other environmental contaminant into the skin. Toner can also protect the skin even with the counteract chlorine and minerals contained in water flowing in the pipes of drinking water or clean water. Content of the largest toner serves as humectants, which means that this substance helps moisturize the skin. Toner can also be used as a substitute for face wash when greasy or dirty. Toner will revitalize the skin, even when you're in a hurry to leave. Toners containing glycolic or alpha hydroxy acids can help prevent ingrown hairs, so that also helps prevent facial skin problem.